Dhanush's next movie Shamitabh is releasing in another 2 days, and then Anegan and Maari are waiting in the line. The actor has now signed his next movie with director Prabu Solomon who has embarked his name with a bang with his movies like Mynaa, Kumki and Kayal. 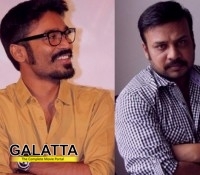 Both Dhanush and Prabu Solomon have proved that they handle intense scripts with ease. Known for their hard work, our curiosity only increases with the duo coming together. This movie is tipped to be an action movie and D Imman will be composing the music. This movie will be produced by Sathya Jothi Films who have produced movies like Moondram Pirai, Kizhakku Vaasal, Idhayam, Parthiban Kanavu & Em-Mahan. This yet to be titled movie will have V Mahendran for cinematography, editing by Das (DON MAX) and Raahul as the executive producer. The rest of the cast is yet to be finalized. Stay tuned for more updates. >>Mani Ratnam Goes the Maari Way! >>Dhanush rules 2 million hearts!